I have never been shy about my age. I am on the back half of my 40's and have been reading comics for over 30 years. I have read so many comics ... some might say too many. But I can remember as a kid, sometimes comics would just transfix me. I'd be gripping the pages, so engrossed, pulled into the story. One of the most common types of books to grab me like that would be an outright brawl between heroes and villains under the most dire circumstances. Add a little plot and I would be transported into the universe. I long for those moments now. When a comic can make me be young Anj again, heart-pounding, watching titans battle, the fate of the world at stake, I am ecstatic. But with so many comics under the bridge (so to speak), it is hard to do that. How many world-saving fights can I read? All of this preamble is to set the stage for Action Comics #983, a comic by writer Dan Jurgens and artist Viktor Bogdanovic. It is the Superman Family versus the Superman Revenge Squad with planet Earth at risk. There are battles and tragedy and a great wrinkle. 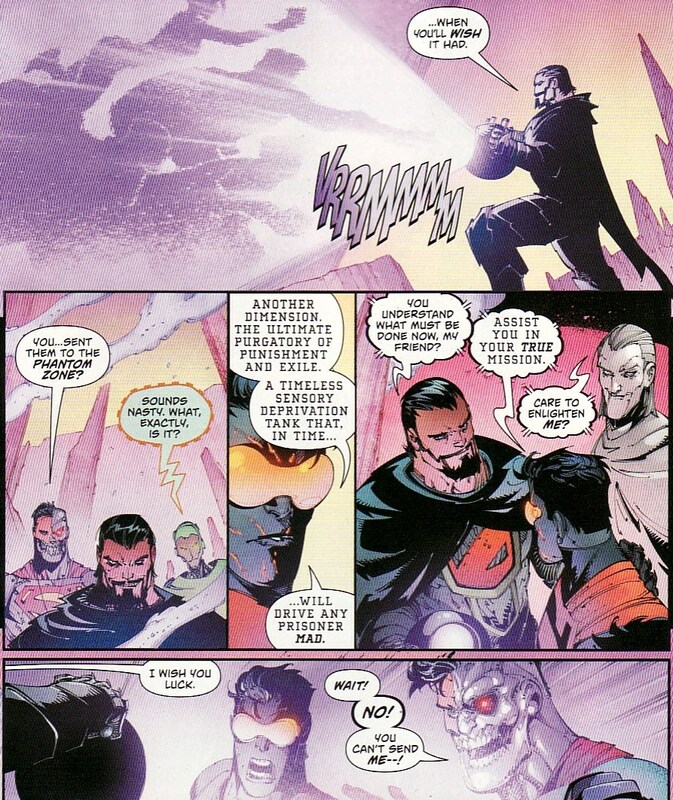 There is General Zod that I actually like reading, loving to hate him. And there is so much Supergirl, appropriate for a Superman Family fight but something missing for too long in the super-books. I read the issue and reread it and reread it again. I was young Anj, reading a comic he had folded and put in his back pocket, under a tree at the summer hour again. God I loved this issue. This is why I still read comics. "Revenge Part 5" picks up right where the last issue left off, a standoff between Team Superman and the Revenge Squad. A blinded Superman hopes that this influx of allies will even the odds. Meanwhile, Lois and Jon are trying to sneak out the back door in an escape pod. Look at this two page splash. Brilliant. We see the scope of this battle. It is going to be epic. And I like this angle, the villains in the foreground looming, the heroes together, bracing themselves. We could have gone classic, the two teams facing each other like the Secret Origins of the Super-Villains treasury or Uncanny X-Men #100, but this slight turn of the camera adds a fresh perspective. And then we get a rundown of all the participants. As I have said ad nauseum on this site, the cousins need to be loving family, supportive, and present. We didn't get that much for the first years of the Loeb take on the character or the first years of the New 52 book. That is being fixed in Rebirth. Kara is the first one named. She says families stick together. Perfect. And Lex as an ally is still something I am getting used to. And I don't know how much we can trust him. He seems interested that these villains want into the Fortress. That little 'curious' is so ominous. Because regardless of recent history, he is still Lex Luthor. And then the groups break off into pairs for combat. The Cyborg Superman may have brought these people together but it is clear that Zod is in charge here. He is the one leading the villains. I have never been a big fan of Zod, feeling he has been overused since New Krypton and usually a tad boring. But this Zod, scheming, angry, and filled with hate has grabbed me. 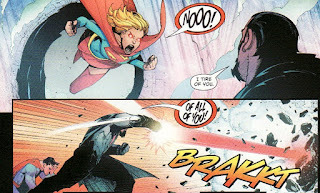 And I love that Supergirl is tasked with fighting the Cyborg Superman. A version of the Cyborg has been a thorn in Supergirl's side for a while now. She is ready to throw down. Steel fights Metallo. 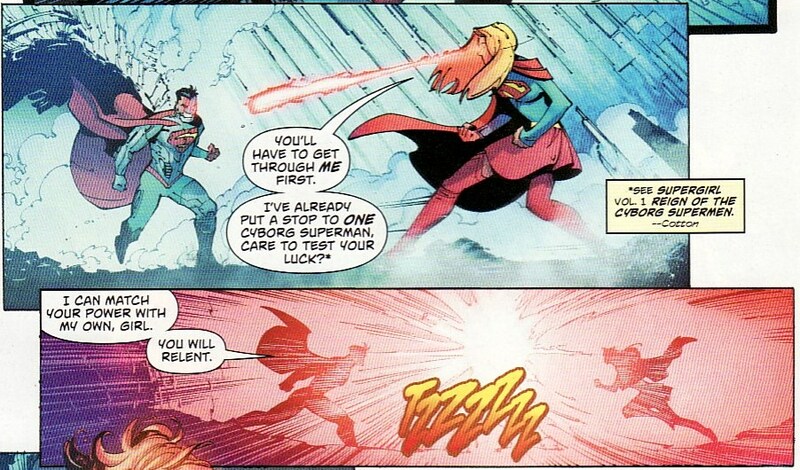 Superwoman fights the Eradicator. All the fight scenes are tense and gripping. I love how Lex isn't scared of facing off against a monster like Mongul. 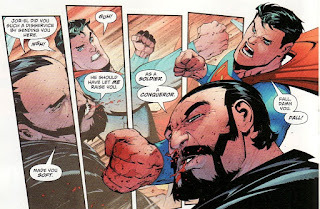 But the big fight is Superman versus Zod. It doesn't take long for Zod to deduce that Superman is blind. The General clearly has the upper hand. But this sequence shows how Zod can also fight a psychological battle as well. He calls Superman weak and soft. Kal could have been more ... a conqueror. Saying these words while absorbing the biggest blows Superman can deal out is just wickedly fantastic. You are weak, physically and mentally. You could have been something more. Now that is a Zod I can sneer about! But then Zod hears Lois and Jon trying to sneak away in the escape pod. And this infuriates Zod. The idea that Clark has a family enrages Zod. He lays down a sort of curb stomp, screaming that Superman doesn't get to have that. Is this because Zod thinks it weakens the Kryptonian bloodline? Or is this somehow linked to Zod being denied a family? 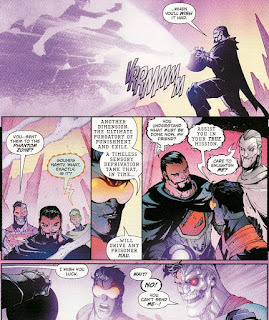 Are Ursa and Chris Kent in continuity? Is Zod upset because Clark has something that Zod wants, that Zod lost?? Again, all this makes Zod more three-dimensional, more odious, more villainous. Faced with losing her cousin's family, Supergirl shows how fierce she can be. I use that word ... fierce ... a lot to describe Supergirl when she sees an injustice and lashes out against it. She is less controlled than Superman at times. This panel shows me that fierceness. I love it. Zod wipes her out with one punch. But then there is one more twist. Already Zod had won me over as a tremendous villain. But he had one more trick up his sleeve. From the beginning, Zod has said he wanted the Phantom Zone projector from the Fortress to release his army to run roughshod over the world. But it was a lie. He wanted the projector to use it. Without hesitation he sends the Superman Family (except Supergirl) into the Zone. And then, he wishes the Eradicator well in fulfilling his 'secret mission' and sends Cyborg Superman and the Eradicator into the Zone as well. A backstab ... no honor among thieves! Now that is an incredible ending to an incredible issue. What is Zod's secret mission? Why did he leave Kara out of the zone? Where are Jon and Lois? I want more. I want it now. I'll be here under the tree in the backyard of the summer house! At the beginning I wasn't thrilled with this "Revenge" arc, but my interest has grown with each issue exponentially. "Kara is the first one named. She says families stick together. Perfect." I noticed it and she's the one is closer to him. Great detail. I like. It's curious Superman called him Kara Danvers. Maybe Jurgens -who wrote Post-Byrne's Superman- thinks they must consider their Earth names to be their real names? Kara saying she's already put a Cyborg Superman down is a great bit of continuity. And Bogdanovic draws her heat vision in a very curious way. Rather than a red laser beam it looks like a flare springing from her eyes. "The idea that Clark has a family enrages Zod. He lays down a sort of curb stomp, screaming that Superman doesn't get to have that." Yes, that's interesting. Zod got real mad. Murderously mad, in fact. Why Superman having a family is his berserk button? Supergirl -apparently- losing her family is definitely a berserk button for her. And who can blame her? I love how overprotective she is from Lois and Jon, and how fierce she looks. I wish she put up a good fight, but I've to admit Zod has crushed everyone easily. By the way, some fans are guessing Psi will help get Superman out of the Zone. They're aware of the latest developments in the Supergirl book! How cool is that? 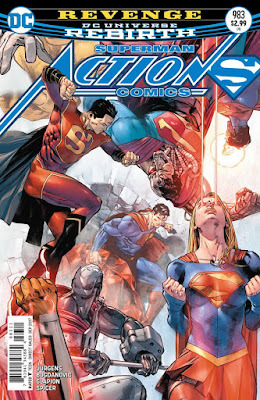 I was concerned about Jurgens treating Supergirl right, but so far I'm satisfied. I wish Dan Jurgens would have gotten the chance to write the real Kryptonian Dru-Zod thirty years ago. His Zod is overwhelmingly powerful, slimy and cunning. I wonder how Superman and Zod met in the current continuity. "Lost Son" is partially in-continuity? Clark came face-to-face with some of similarly-named replacements DC came up with back when they refused to admit that "Last Son of Krypton" mandate was ill-conceived and was hurting the books? 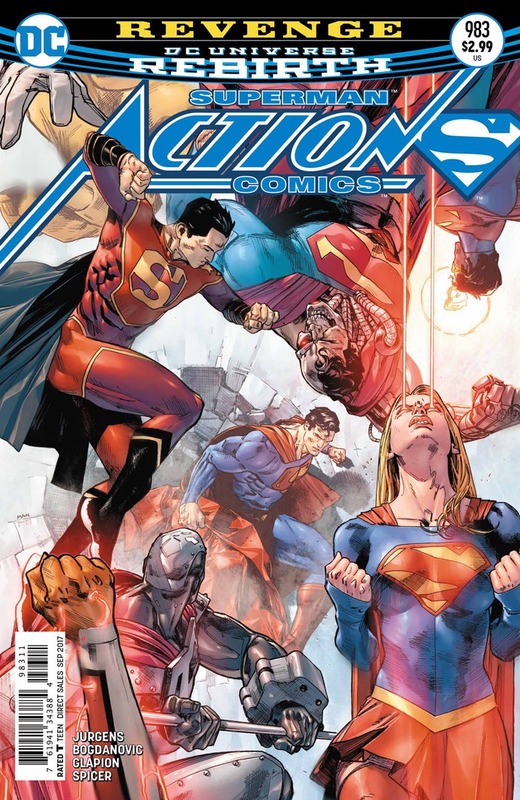 I also wonder... maybe the current run is so successful because: a) Jurgens has gotten plenty time since the end of his former run to come up with new Superman storylines; b) the current Superman is different of the Byrne version. Clark thinks of himself as Clark but he doesn't shun his heritage, he's been a Legionnaire and he has Kryptonian family left. So Jurgens has more toys to play with. There are actually too many titles from too many publishers. And sometimes I get confused easily. I try sticking to a few titles only. From DC, i only read Justice League, but then again, after the New 52, a new restart again. I loved this issue too. 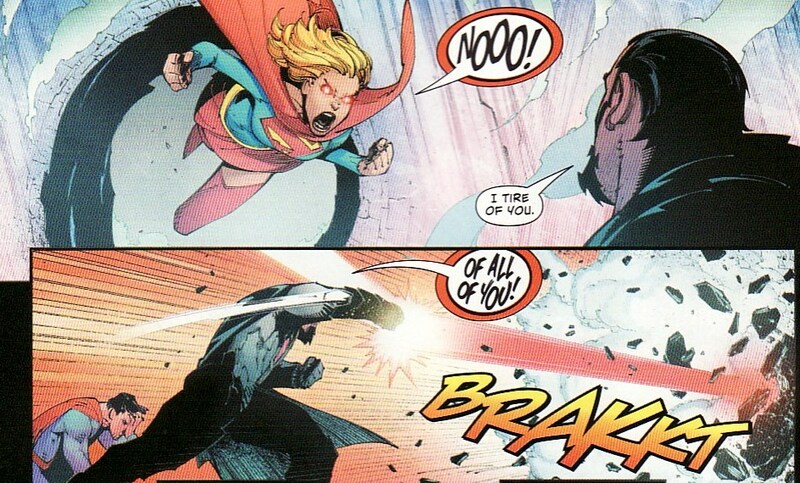 I really wish Kara had gotten to drive Zod halfway through the fortress before he knocked her out though. With her rage there she felt halfway to going solar or have that red lantern rage drumming "Da-dum Da-dum". I'm wondering if they chose to leave Kara out of the Phantom Zone to not have to deal with the fact that she has a buddy there who is pretty much a Goddess of the Zone, or if they had planned it all along. While I don't think they will bring Psi in in the next issue there, I really wish they would do it to strengthen the feeling of a coherent one shared universe. And some off topic news. Looks like Brian Ching will keep doing Kara stuff. I'll check it out when it comes. Heh... Kara Gordon, that's a one person SBBF. Surprised you didn't mention that cover, which I thought was stunning. Especially heat-vision Kara. Fierce, indeed. I wish I managed to get as enthusiastic as you Anj, but I seem to only see the wasted potential these days. The cover art is fabulous, but I liked the interior art of the previous issue better. Jurgens apparently is not a believer in "less is more". A ridiculous amount of villains against a blind Superman is countered with every 'S' there is (except Krypto! ), and predictably it's far too much for a single issue and most battles are only given a few uninteresting panels, with no sense of how the individual battles are going or why. That Zod dispatches her with a single blow makes her seem inept. I don't like that. I also think it's inept story tellling that we have no idea that the blow took her out until three pages later. Since she's not even in the punch panel, we don't know what effect the punch had on her. For all we know, she's coming back at light speed in the next panel. 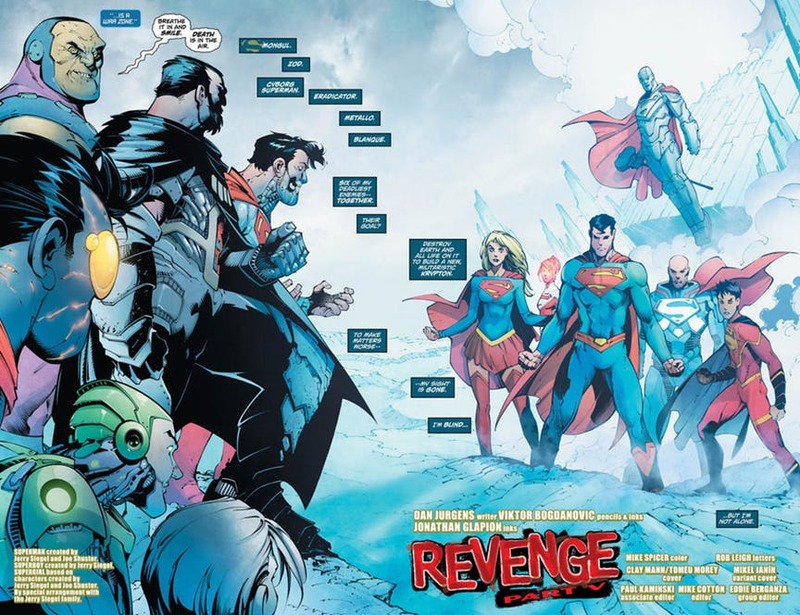 And if leaving Supergirl alone with the villains, when all the other heroes are sent off into the zone, is to be of any sort of consequence, how is it not the cliffhanger image!? Instead we have a tiiiny illustration of her off in the background, as if it didn't matter. Loved it! I was so drawn in that any nits remain unpicked. I am so looking forward to next issue to see what happens with Kara, and hopefully Krypto, and perhaps even the owner of the mysterious voice from last issue - my guess in Mon-El. I just thought it was a great romp. Too much fun in a big bruising fight. And Mart I thought of Mon-El too! I loved it too. This storyline has been firing on all cylinders for me. Glad we're getting such good Superman stories these days! Livewire Coming To Supergirl Comic? ?